While most people play slots for the fun of it and the occasional winnings that they provide, there is one thing that could make all the difference and it is called a progressive jackpot. It is a concept of almost mythical proportions, and yet supported by the lists of lucky winners that online casinos provide in order to attract more players. Winning one of the available progressive jackpots is a thought that every slot player likes to entertain every once in a while as it adds an additional thrill to the game. 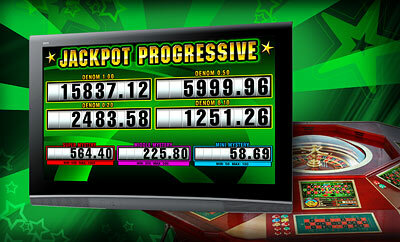 By definition, a progressive jackpot is the largest payoff amount that a player can get out of a slot machine. The amount of progressive slot jackpots increases over time with every game played on a particular slot machine or a network of machines linked together to accumulate the respective progressive jackpot. In order to win one of the slots jackpots, a player has to hit a very specific combination of symbols. Once the jackpot is won, it goes back to a preset minimum level and starts accumulating again. It is logical to assume, therefore, that the more players make an input for one of the progressive jackpots, the bigger it is going to get over a relatively short period of time. This in turn means that it is online casinos that offer the best progressive slots jackpots that can literally reach millions of dollars and thus be life-changing for those lucky enough to win them. Unfortunately, this also means that there are more players competing for the most appealing slot jackpots and each one of them has an equal chance of winning it with his or her next spin. Of course, it is possible to play on a slot machine which has its own progressive jackpot; however, in this case the amount will hardly be spectacularly high, since you will be the only person making an input for that particular jackpot. Besides, there is an additional thrill involved when you think that you will be competing for one of the progressive slots jackpots with players from all over the world. However, if you have decided to play for one of the progressive jackpots that online casinos offer, there are some things that you should keep in mind. First, you need to make sure that there is a progressive jackpot worth playing for. That at least is easy enough, since on the websites of online casinos you can easily find information about the amounts of progressive slots jackpots; for instance, if a progressive jackpot starts at one million dollars or a similarly attractive amount, then perhaps it will be worth spicing up your game by playing for it. However, you should also be aware that sometimes the payout rates of slots accumulating progressive slot jackpots are a little bit lower. This is quite logical, since a part of the amount you would win otherwise, is diverted for the purposes of jackpot accumulation. Therefore, it is up to you to decide how much the amount of the potentially more regular payouts matters to you in relation to the possibility of winning one of the mythical life-changing progressive jackpots.